The key to understanding Spanish cuisine is its roots in peasant cookery – it's no wonder Spanish food is called ‘the people’s cuisine’ and it relies on uncomplicated food based on key ingredients grown or available locally and in the freshest possible state. In addition, Spanish food is strongly regionally defined because the mountain ranges that run through the country isolated regions which became strongly focused on their own local foodstuffs and traditions. Virtually every Spanish dish contains olive oil or garlic, or both! These ingredients, which are produced all over Spain, are key to the culinary secrets of Spanish cuisine and buying the best quality olive oil, and using it liberally, is one technique which will deliver good results. When cooking Spanish food, try to buy Mediterranean garlic – this may be smaller and more purple than other garlic heads but will have a more intensely sweet flavour which really ‘lifts’ a dish. Perhaps the best known Spanish food is Paella, made along the coast in huge paella pans and traditionally often prepared communally for a group, such as fishermen returning from the sea, or farmhands from the fields. 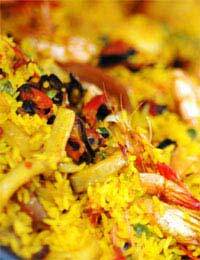 Paella is an explosion of flavours and textures, liberally seasoned to create an exciting dish. By contrast, the simple ingredients in a Spanish omelette rely absolutely on their freshness and quality to produce a subtle and satisfying taste. Heat the stock and infuse the saffron in it. Cut the chicken thighs in half and brown in half the olive oil in a paella dish or heavy based pan. Add the chorizo and pancetta and fry until crispy. Now mix in the garlic, onion and pepper stirring until soft at which point you add the thyme, chilli flakes and calasparra rice. Now stir gently but thoroughly until the rice is coated and glossy with oil, before sprinkling in paprika, cooking for a minute and adding the dry white wine. When the wine comes to a simmer, pour in the hot chicken stock, add the chicken thighs and cook for five to ten minutes. Set the clams around the edge of the dish and add the peas and chopped tomatoes. Continue to cook gently for another ten to fifteen minutes and if any clams have not opened, remove them as they may be bad. While the paella pan is simmering, heat a separate smaller pan containing the remaining oil and add the garlic cloves. Fry them on a medium heat for a minute and scoop them out of the oil into the paella. Repeat the process with the squid. Now sprinkle the parsley over the pan and serve immediately. Peel or scrub the potatoes and cut into thick slices. Dice the onion. Heat the olive oil in a large deep-sided frying pan, then add the potatoes and onion and cook on a medium heat, partially covered, for around half an hour, stirring gently from time to time, until the potatoes soften and the onions are translucent. Gently tip the vegetables into a colander placed over a large bowl to catch the strained oil. Now beat the eggs with seasoning and stir them gently into the potato mixture with the parsley. Heat a small amount of the strained oil in a smaller frying pan and pour the mixture in on top of it, cooking over a moderate heat. Use a wooden spatula to push the omelette into shape by lifting the edges and pushing them up to form a wall. When the omelette is almost cooked through, put a plate over the pan, turn upside down and then slide the plated omelette back into the pan so that the top is now the bottom. Cook for a few minutes, and then repeat, pressing the sides up each time to keep the high shape. Slide the cooked omelette onto a clean plate and leave to stand for five minutes before serving.